The apartment, like many of students’ apartments, was located in the area where a lot of immigrants live, which was considered an inexpensive area. It was also a pretty big apartment with five or six rooms (which I cannot recall by now). When I was there, there were four other people living in that apartment and they were very nice. They asked Lisa and I to eat with them, allowed us to use their computer, and invited us to watched movie together. I felt very much welcomed. One of the people who lived in the apartment (which I now forget the name. stupid me!) told us some hints on the cool places we should visit and the best way to get around. One thing that he told us was Bus 200. This public bus number 200 was a great way to reach almost all the touristic places and famous landmarks. It is also the cheapest. So, Lisa and I ended up taking Bus 200 on the day we arrived in Berlin. 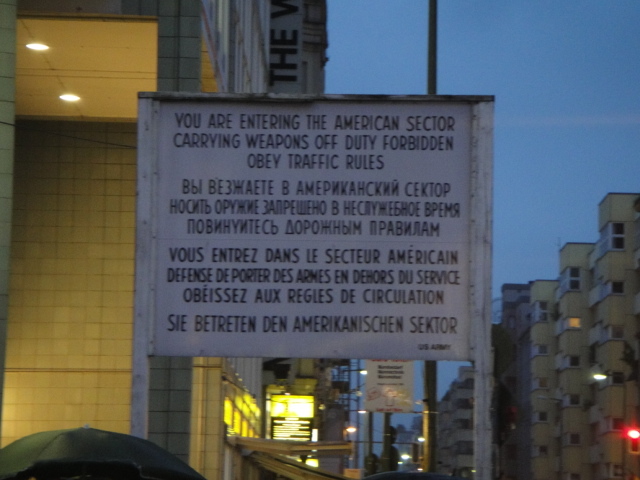 Unfortunately, the weather in Berlin did not welcome us as nicely as the people that we met. The rain was pouring on and off, and it was basically cold, almost all the freaking time. When we took the Bus 200, I couldn’t take any nice pictures because of the steamy and wet windows from the bus. We also were too lazy to get off the bus and spend time in those touristic places. Including, the well-known Reichstag, the parliament building that was also functioned as a city look-out. The queue for entering the great glass decorated building was too long to handle, some people even queueing under the rain. I could only saluted them. We did, however, went to the Brandenburger Tor aka Brandenburg Gate. The world’s famous gate, which was used as the city gate (back in the olden days) and is now used as symbol of Berlin and Germany. And when I said symbol, I really meant it. They use pictures of the Bradenburger Tor everywhere, like wallpaper or wall stickers. The thing is, Berlin is a huge city. Lisa showed me on the map that we clearly didn’t go to every corner of the city. But, I believe that I went to some of the coolest spots in there. 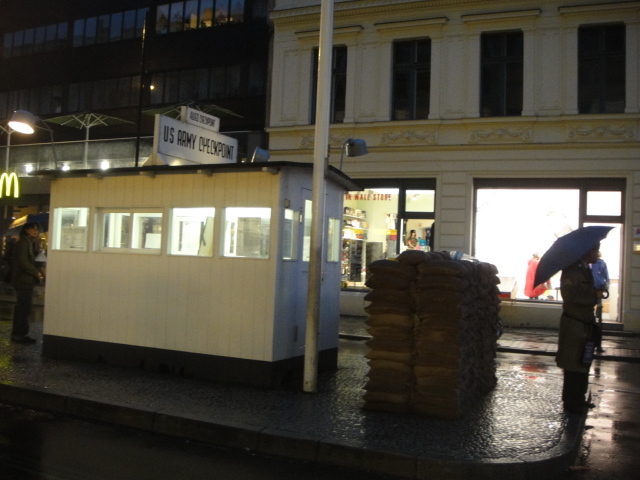 For example, the Checkpoint Charlie. When I was there, it was pretty cool to imagine how people had to go through the security checkpoint to go from one point of a city to another. It was a pretty screwed up time, indeed. Before I showed more pictures from other cool places, I wanna show you this particular picture first. 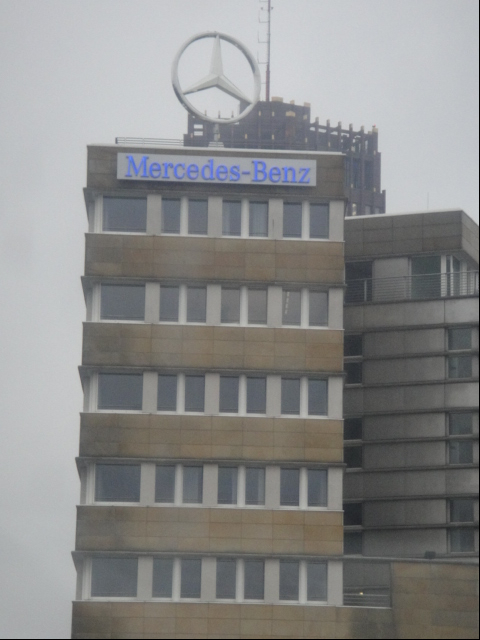 Above is the picture of one of Germany’s most successful companies, Mercedes Benz. On that picture, you can see that they have the ugliest skyscraper they could ever imagine. I mean, with their yearly profit and with so many architectural inspiration in Germany, their building stuck in the somewhat fascist architectural style. But in their defense, they care more about what they ride, I guess, rather than where they’re staying. Aside from the awful building, however, on the above picture, you can clearly tell that it was a bad day in Berlin. On that day, it was either raining or seriously cloudy. Anyway, move on to another cool spots in Berlin. So, like Hamburg, Berlin also has several happening areas where cute boutiques and hip shops located. One area that I went to was called Prenzlauer Berg. This area was filled by cafes galore. And another thing that got my attention within this area was, of course, the squat house. One thing that I forgot to mention about the squat house was that nowadays, the hippies like to create small events in or around the area of the squat house. On our last night in Barcelona, Lisa met a guy who invited her to come to some events in a squat house. 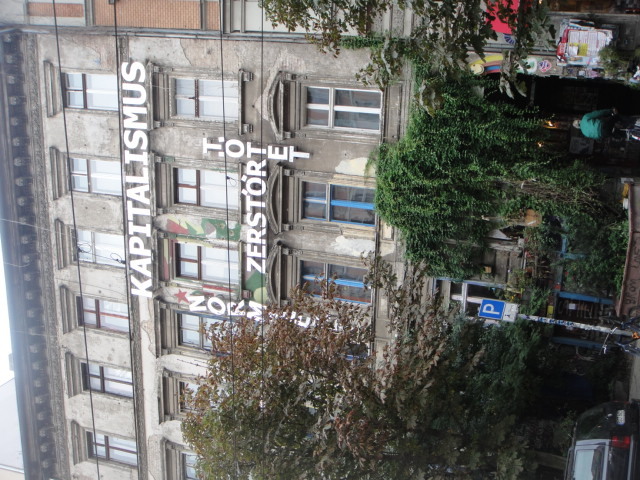 So, even though it is illegal, some squat houses are legalized and open publicly for some small art events. 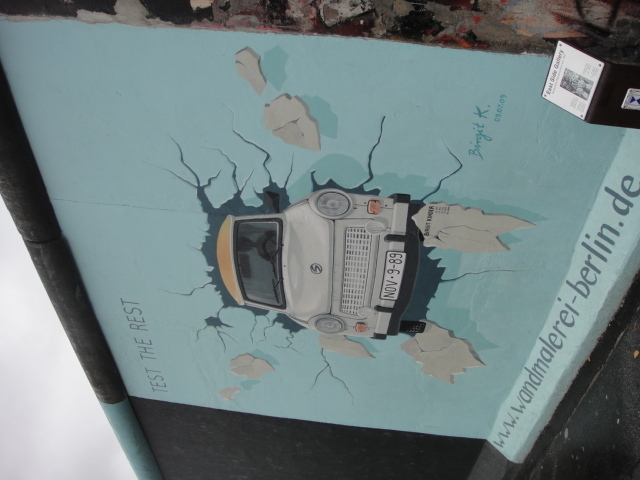 The last cool spot in Berlin, the must-visit place in the city, was the Berlin Wall (D’OH!). 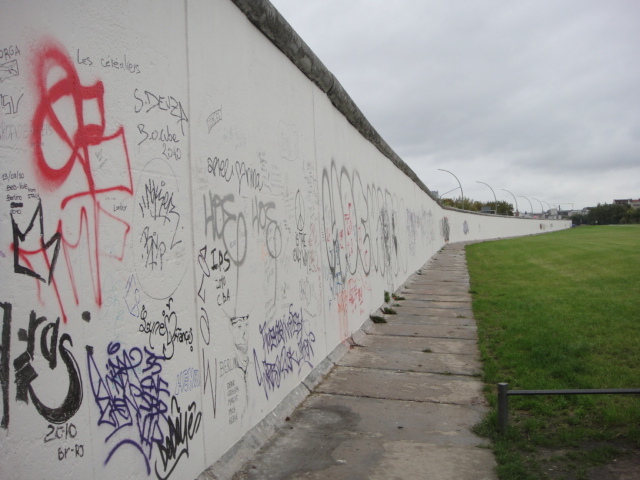 I went to the area where the remaining of the historic wall that is now called East Side Gallery. Most of the paintings on the wall were new. The paintings that looked like they had been there forever were actually not the original ones. They had been re-painted over the years to make it interesting for tourists. Some of the pictures of the wall that I took can be seen below. The above picture was one of the very famous original paintings on the Berlin Wall. The whole wall had been restored over and over, but this painting is still up there. To know about this painting, you can come here (unfortunately, it’s in German). The above picture was taken from the eastern side. 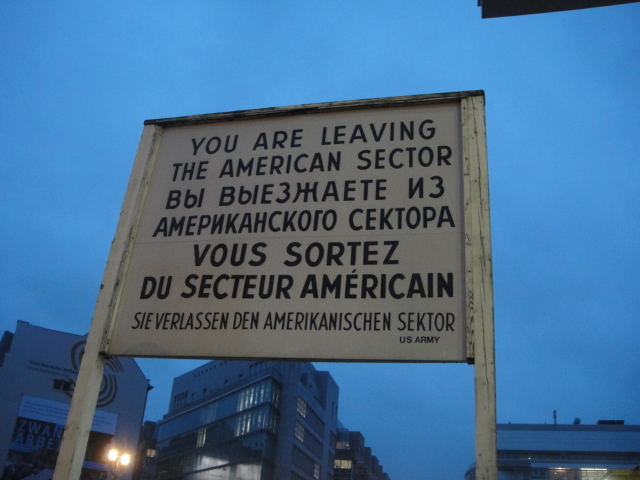 This picture did not look very original, because those vandalism graffiti did not exist back when Berlin was separated. In fact, people couldn’t get near the wall because the wall was surrounded by guards and to get to the wall there was an extensive field that was guarded by military. Anyone who wanted to get close were shot to death right then and there. And here it goes, the most famous painting on the Berlin Wall. It is Kiss of Death. 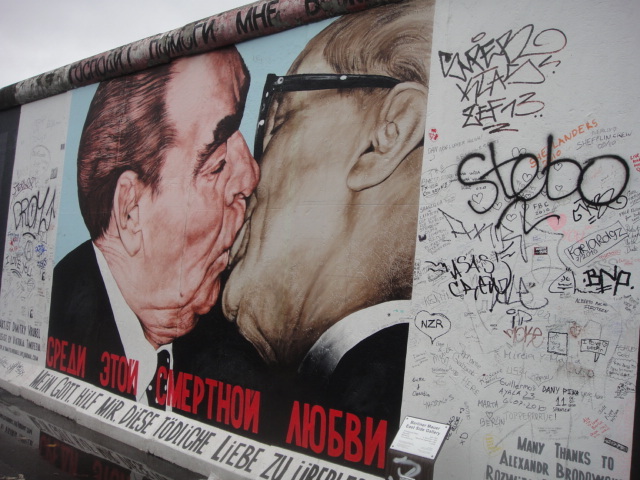 This well known painting showed a kiss between a Soviet leader and his East German counter part. This kiss has been a symbol of rebellion and a number one tourist magnet. So, I went to the cool spots in Berlin, but guess what I now have as souvenir from the cool city? When I’m traveling, I usually buy postcards to collect. On the picture above, you can see the two coolest postcard that I now posses. 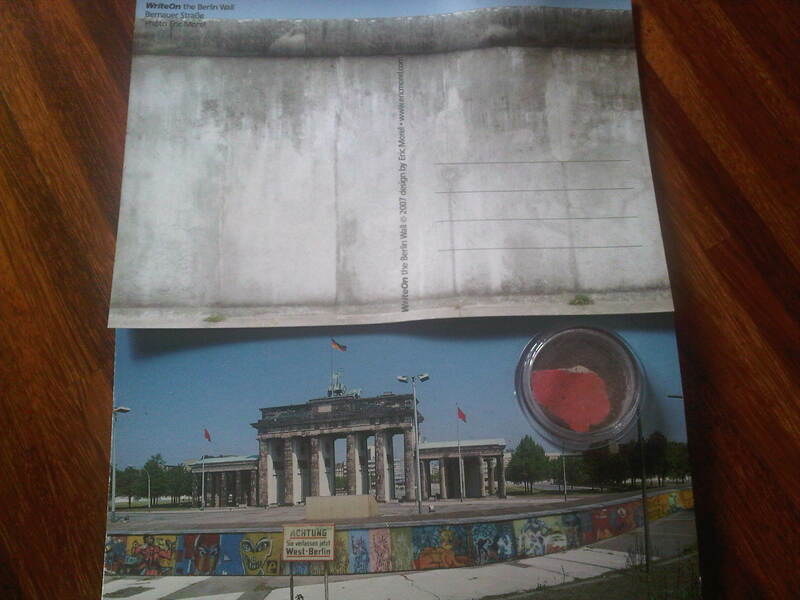 The first one is a postcard which fulfill your desire to write in THE Berlin Wall. The second one was a postcard with the old Berlin Wall picture on it and a PIECE of Berlin Wall attached to it. Now, I (and my friend, Diah) am a proud owner of a piece of Berlin Wall. A funny remark was made by Lisa when we were at a souvenir shop and amazed by the pieces of Berlin Wall that people could buy. Now we all know, indeed. There it was, some cool spots in Berlin. There are, of course, tons other cool spots in the city, which I was not able to go. As well as other touristic spots such as Alexsanderplatz and its TV Tower, which I didn’t get good picture of because of the crappy weather. One thing that I didn’t do in Berlin was to go to any museums galleries. Despite the countless number of museums and galleries in the city, I decided that my brain would not be able to digest any sense of more arts and history, after all day touring around the seeing all the cool spots I just mentioned. No worries, I will come back, later in my life, anyway. 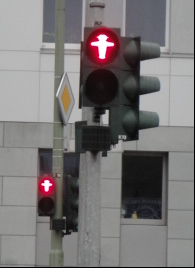 And since I mentioned a lot of Berlin‘s symbols through out this particular post, let me say good bye to you by introducing to you another Berlin‘s symbol. 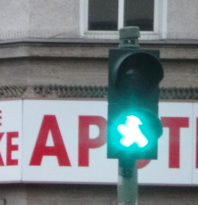 The cutest traffic light symbol in the whole wide world. Great to journey around Berlin in your excellent travelogue. Enjoyed this post!